Time for another sketch from CPS...Somewhere I got sidetracked when creating using this weeks sketch. I did change mine a bit, as I made an A2 sized card and the thin strips on the card are extended from edge to edge on my card. I used Great Friend from the Occasions Mini, stamping the sentiment, border and butterfly in Gray. The butterfly and stamped image were both cut by hand. 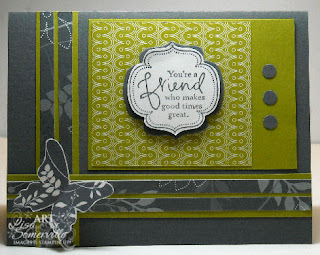 The Gray panel under the sentiment was cut using the new Matchbox Die, also from the Occasions Mini. I really like the gray with this green. And the way that you did the thin strips on the side and bottom is very elegant. I love that butterfly down there and the brads on the side...the colors are great too! :) It's a fun card!! I love this! Love that little label with you greeting in it. LOVE that butterfly and great use of the CPS sketch. I never would have thought to put these colors together, but I LOVE the effect. It is great. Can't wait to try it and I may CASE your card! lol Thanks for sharing. Oh wow, I really like the colours in this card. I love green. Also like the look of that DSP. Great card. I just ordered this stamp set! Thanks for the inspiration! This is so pretty!!! I love the yummy colors you used!